Love them? Hate them? Want one? Have one? Nobody seems to be neutral about tattoos. But there's one thing we can all agree on. Tattoos have been around since the beginning of human history, and they aren't going away anytime soon. The word tattoo is derived from the Tahitian word "tatau" which means to mark something. The history of tattoos is as diverse as the people who wear them. The reasons for having a tattoo are just as varied. A tattoo can be a rite of passage, a sign of belonging to a clan or group, a status symbol, a token of bravery, a mark of beauty, uniqueness or self expression. The usual method of tattooing involved piercing or cutting the skin with a sharp object, rubbing colored pigment into the wounds and letting them heal. There were many variations on this method. Even today's techniques use the same principle. 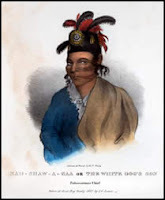 Tattooing was widespread among Native American tribes. For example, the Sioux believed that after death the spirit of a warrior mounts a horse and sets forth on its journey to the afterlife. Along the way, the warrior meets an old woman who demands to see his tattoos. If he has none, she turns him back to wander the world as a ghost. Tattooing was practiced in many Asian cultures. 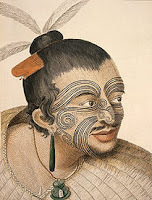 Elaborate facial tattoos were especially prevalent among the Maoris of New Zealand. Even among modern Maoris, these tattoos are still a source of pride. 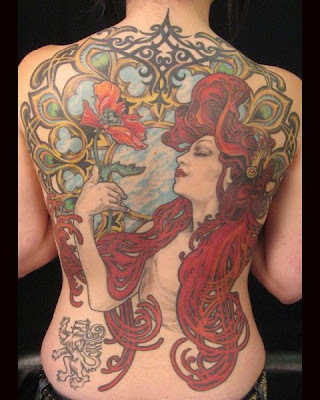 Tattooing was brought to Europe in the early 1800s by sailors who'd discovered it in the South Pacific. Over time it became a fad among the aristocracy. Even members of the British royal family sported tattoos. Inevitably, the practice of tattooing spread to America. The first permanent tattoo shop in New York City was set up in 1846. 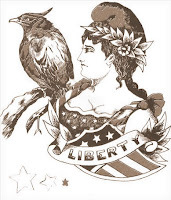 Most of the customers were military servicemen, and the tattoos tended to be patriotic or romantic in nature, especially with the onset of the civil war. Getting a tattoo wasn't for the fainthearted. The needles were attached to a wooden handle. The tattoo artist dipped the needles in ink and moved his hand up and down rhythmically, puncturing the skin two or three times per second. The technique required great dexterity and took years of practice to perfect. Even for the best artists, the process was painfully slow. After Samuel O'Reilly invented the electric tattoo needle in 1891, tattooing became easier, cheaper and more common. Even women began getting tattoos. A few people had their entire bodies covered with skin art--a guarantee of employment in traveling side shows. In the American West, most tattooing would have been done in the larger cities. A cowboy with a tattoo would probably have either been in the military or in prison, where inmates tattooed each other, often badly. In today's society, tattoos are more popular than at any time in American history. 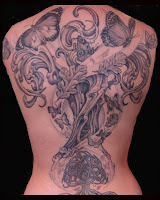 With academically trained artists entering the profession, tattooing can rise to the level of fine art. These two examples were done by Teresa, an artist working in Santa Cruz, CA. She has a degree in art and a growing reputation as a painter. She also happens to be my daughter, and, yes, I have a sample of her early work, a little butterfly on my back. I wear it proudly. For me, it's a connection to someone I love.